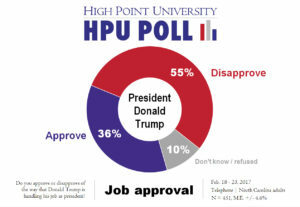 HIGH POINT, N.C., Feb. 28, 2017 – The second High Point University Poll of 2017 finds that North Carolinians give President Donald Trump the same job approval rating that they did in the first poll of the year, at 36 percent, and Gov. Roy Cooper holds an approval rating of 44 percent while a large majority of those polled continue to say the country is headed in the wrong direction. A little more than half (55 percent) of North Carolina residents say they disapprove of the job Trump is doing as president, compared to 52 percent who said the same thing in early February’s HPU Poll. 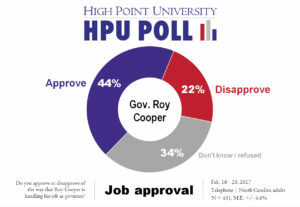 About one in five (22 percent) of these same North Carolina residents say they disapprove of Cooper’s job performance, with a third (34 percent) refusing to offer an opinion either way. This is about the same as the early February poll results, where 46 percent approved of the governor’s job performance, 21 percent disapproved and 33 percent did not offer an opinion one way or another. Three out of five (60 percent) North Carolinians say the country is on the wrong track which is not significantly different from the 61 percent who said the same thing in early February. Thirty-nine percent of these North Carolinians say that the country is better off than it was eight years ago compared to the 49 percent who say that the country is worse off. 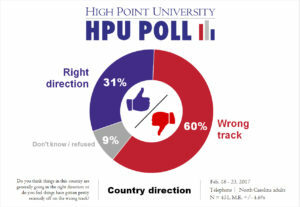 Thirty-six percent said the country was better off when the HPU Poll asked the same question in early February. In other findings, about one out of five (22 percent) of North Carolinians approve of how the U.S. Congress is doing its job. The early February poll found similar results with 23 percent. The North Carolina General Assembly had a job approval rating of 29 percent with 45 percent disapproving and almost one third (26 percent) refusing to offer a view either way. 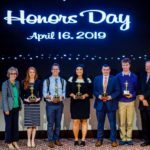 The result is about the same as the 27 percent approval rating reported in the early February HPU Poll. Would you say that the country is better off or worse off than it was eight years ago? Do you approve or disapprove of the way that Roy Cooper is handling his job as governor? 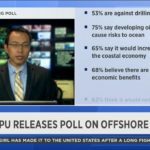 The most recent HPU Poll was fielded by live interviewers at the High Point University Survey Research Center calling on Feb. 18-23, 2017. The responses from a sample of all North Carolina counties came from 451 adults with landline or cellular telephones. The survey has an estimated margin of sampling error of approximately 4.6 percentage points for all adult respondents. The data is weighted toward population estimates for cellular and landline telephone use, age, gender, race, and party identification. In addition to sampling error, factors such as question wording and other methodological choices in conducting survey research can introduce additional error into the findings of opinion polls. Details from this survey are available at http://www.highpoint.edu/src/files/2017/02/51memoA.pdf.